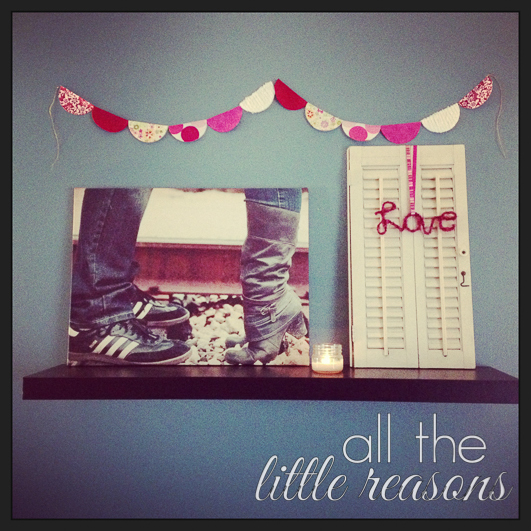 Remember this blog post where I taught you how to make the cute yarn Love sign? 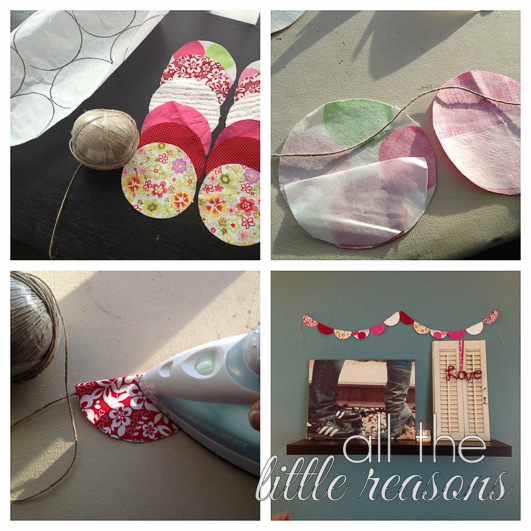 Well, here’s a short tutorial on the half round bunting I hung with it! This cost me nothing because I had everything on hand. I just chose fabrics that coordinated, dug out some jute twine, and reused the Wonder Under from my son’s Birthday shirt. You can find Wonder Under in the part of the fabric store that sells interfacing. The people who work there can direct you to it! Also, you don’t need to use twine. String, yarn, baker’s twine, or very thin ribbon would all work fine. 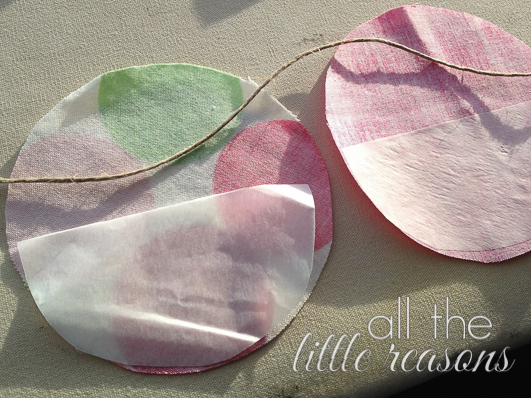 Start by cutting out circles of fabric. I used the bottom of a vase to draw my circles and just cut them out. For the Wonder Under, I used the same vase but cut them inside the line a bit. I didn’t want that to stick out between the layers of fabric in the finished bunting. 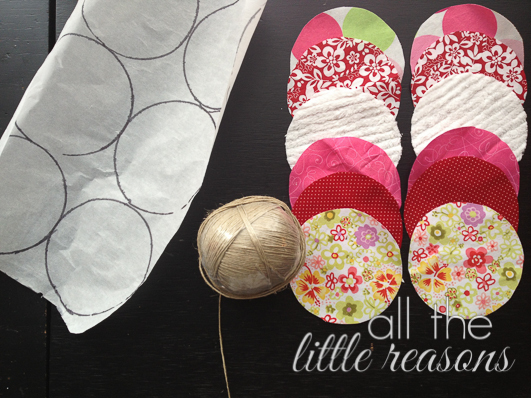 Just a note, you only need half as many Wonder Under circles as you have fabric circles. You use one half of each circle per little flag. Place your circle right side down. The wrong side should be facing up. 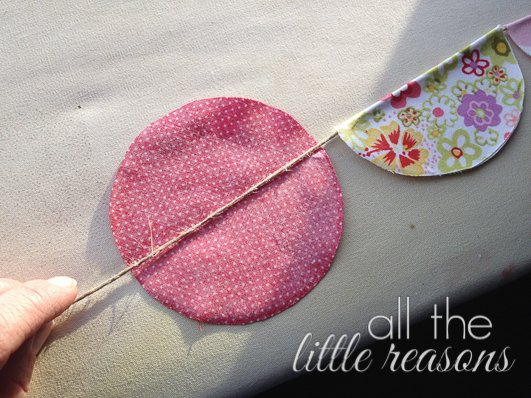 Cut the Wonder Under circles in half and place half of one on the lower half of the fabric circle. Iron it down and then give it a second to cool and remove the paper backing. Make sure your twine is right in the center of the fabric circle. Then fold the top portion of the fabric circle over the twine and iron it down. 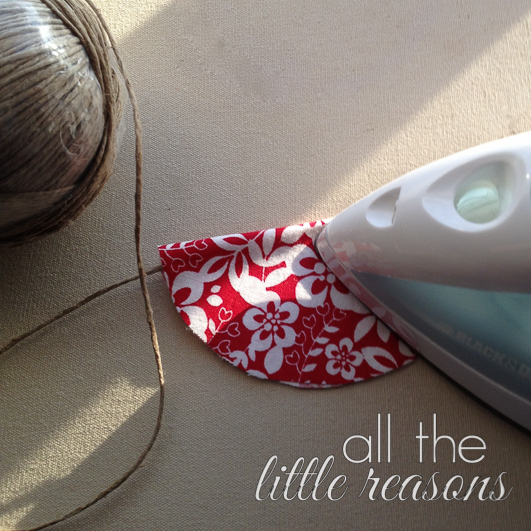 Do this until all your fabric circles are ironed on and you’re done. Hang it up and admire your handiwork!